My first taste of butternut squash soup was at a marche restaurant in Toronto. I was so blown away by its creaminess and flavour I worked hard to recreate it. I think I’ve come close and on top of that it is completely healthy. Theirs probably had cream in it but I have found that this recipe just doesn’t need it. It is tasty and creamy all on its own. Pair this with some fresh baked bread and you really have a heavenly meal. It’s a favourite of mine really, especially when it is cold and rainy. Which happens often out here! Heat the olive oil in a soup pot. Add the onion, carrots, and leeks. Saute until carmelization occurs. Add the squash, pear, stock or water, basil and pie spice. Season with some salt and pepper. Allow to simmer until the squash and pear are tender, about 15-20 minutes. Puree the soup using a hand blender or in batches in a regular blender until it is smooth. Reheat the soup and serve. Makes 8 large portions. Each portion (about 2 cups) is 72 calories, .8 gram fat, 4.4 grams fibre, 17.2 grams carbs, 1.3 grams protein. Calculated if water is used instead of stock. If you need a bit of extra creaminess a dollop of fat free sour cream is excellent in this. I don’t usually do that, made for a pretty picture though! 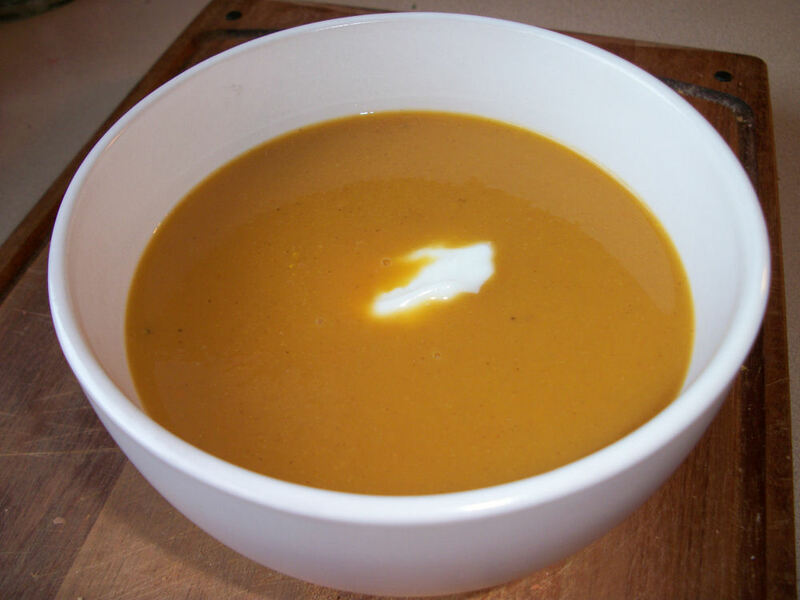 This entry was posted in Comfort Foods, Dinner, Lunch and tagged carrot, leek, Onion, pear, Soup, squash, vegan, vegetarian. Bookmark the permalink. Yum! Butternut Squash is one of my most favorite veggies on earth! Me too! I love how creamy they are. One of my favourite side dishes on thanksgiving was this butternut squash puree my mom used to make. Every year I claimed that dish in the name of hobbitkind….considering my mom and I were the only ones who like butternut squash, no one seemed to mind.